After a big news week with E3, we now have some great news for iOS and Android users. 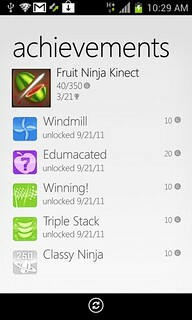 Starting today, the My Xbox LIVE app for iPhone gets even better. The free My Xbox LIVE iPhone app update will let you find, learn more about, and control your favorite content from popular entertainment services on Xbox 360. You can control the content on your console with play, pause, fast forward and rewind controls directly from your iPhone. The new Discover section will let you find fresh entertainment through your phone to play on your console. You can also access on your phone a quick list of your most recent console activity. We’re also updating the My Xbox LIVE app on iPad, which allows you to connect to the Xbox LIVE community when you’re away from your Xbox. With today’s update, we have added retina display support, and improved authentication making connecting your iPad with your Xbox LIVE account easier than ever. Also available for the first time on most Android phones, the free My Xbox LIVE app allows you to read and send messages to friends; manage your friends list and invite new friends; read and edit your full LIVE profile (name, bio, motto); change your avatar features and items with the avatar closet; and view and compare your achievement progress with friends. No, this is not Xbox SmartGlass that we unveiled last week at E3. This is a milestone update to the My Xbox LIVE app on iOS and the first release of the app on Android. Yes, we do intend to bring Xbox SmartGlass to several platforms over time, but have no details to share right now.